Tanya Khovanova's Math Blog » Blog Archive » Which One Doesn’t Belong? I like Odd-One-Out puzzles that are ambiguous. That is why I bought the book Which One Doesn’t Belong? Look at the cover: which is the odd one out? 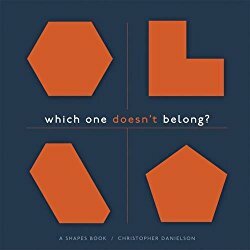 The book doesn’t include answers, but it has nine more examples in each of which there are several possible odd-one-outs. The teachers book for this is great. It looks like you got the student book. The biggest challenge is to find a reason each one of the 4 things doesn’t belong. * Top Left: Is a regular hexagon. * Top right: Is concave. All others are convex. Also, can be divided into 3 squares. Every angle is a right angle. * Bottom Right: Has 5 sides/is a pentagon. All others have 6. I bet they mean the hexagon, since each of the others doesn’t belong (non-convex, sides of not-equal length, and diff number of sides) so the hexagon is odd in that it does belong with any of the other two in an easily defined class. No?